If we briefly listed before telecentres, cybercafés, schools, free WiFi access points, bookshops, bars and cafes as converging actors in the field of e-intermediation, we should definitely add to this list innovation hubs, co-working spaces, fab labs, community centres and a large series of centres, places and organizations that have incorporated ICTs in their day to day and are open to the public. Originally published on March 28, 2014, as El futur de les biblioteques, si és que en tenen at the Fundació Jaume Bofill blog at El Diari de l’Educació). All the articles published in that blog can be accessed at the original site in Catalan or here in the English translation. Batchelor, S. J. & Peña-López, I. (2010). 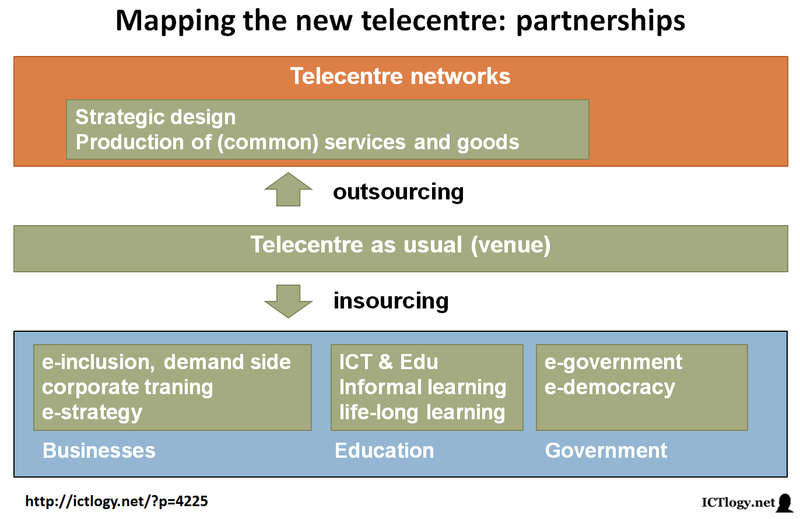 telecentre.org External Program Review. Ottawa: IDRC. Becker, S., Crandall, M. D., Fisher, K. E., Blakewood, R., Kinney, B. & Russell-Sauvé, C. (2011). Opportunity for All: How Library Policies and Practices Impact Public Internet Access. Washington, D.C.: Institute of Museum and Library Services. Information Technologies and International Development, 4 (4), 31–45. Cambridge: MIT Press. Best, M. L. (2010). Connecting In Real Space: How People Share Knowledge and Technologies in Cybercafés. Presented at the 19th AMIC Annual Conference, Singapore. Singapore: AMIC. Gómez, R. (2009). Measuring Global Public Access to ICT. CIS Working Paper No. 7. Seattle: University of Washington. Heeks, R. & León Kanashiro, L. (2009). Remoteness, Exclusion and Telecentres in Mountain Regions: Analysing ICT-Based “Information Chains” in Pazos, Peru. Development Informatics Working Paper Series, No.38/2009. Manchester: Institute for Development Policy and Management. Liyanage, H. (2009b). Theory of change. Impact assessment. Colombo: Sarvodaya – Fusion,. Mayanja, M., Acevedo, M., Caicedo, S. & Buré, C. (2009). 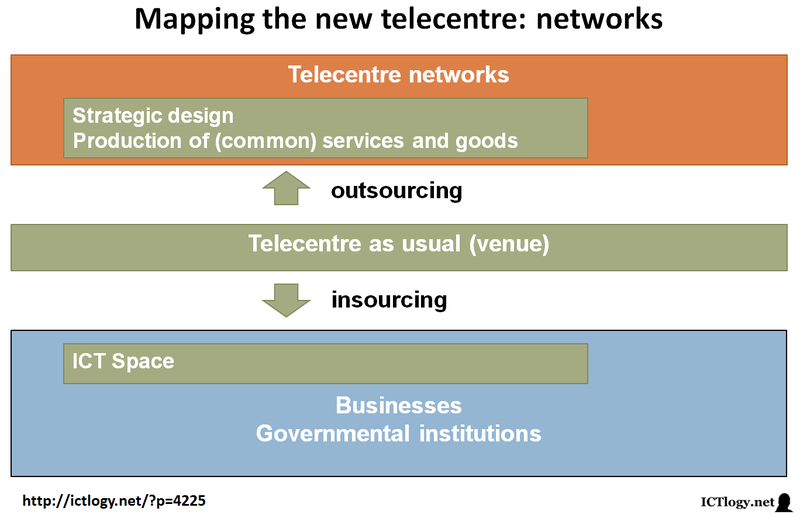 A Guidebook for Managing Telecentre Networks: Engineering a New Phase of the Telecentre Movement. Ottawa: IDRC. On April 12th, 2011, I was in Belgrade take part in the Quality standards in ICT education workshop, belonging to the Click to Europe, aimed at promoting and contributing to e-inclusion of people, businesses and communities in Serbia, thus improving quality of life, employability and social inclusion of citizens . Knowing myself very little about quality standards, I was asked to provide the participants — mainly telecentre administrators and other related profiles — with a general framework where they could situate their own e-inclusion projects and, most especially, what was the importance and role of ICT skills in the whole scenario. Keeping that in mind, and for something more than three hours, I began explaining what the digital revolution was about, that is, what was the outer framework, and went on zeroing in until I ended up talking about digital competence, e-portfolios and personal learning environments. The underlying idea — which almost became a mantra — was that it was not about e-inclusion, but about inclusion, inclusion in an always changing world that required the most valuable skill: being able to learn, to take control of one’s own learning process. And digital skills were there to help people in that. In The digital revolution: citizenship and inclusion in a post-industrial society I explained how digitization implied the shift from an industrial to an informational, knowledge-based, network society, and how in such a society institutions (and intermediators in general) have seen their roles and sheer nature radically transformed. Policies for (e-)inclusion: from physical access to meaningful use depicted a comprehensive model of the digital economy and how each and every category of digital development was strongly related with other ones or with some indicators we generally use to measure development. 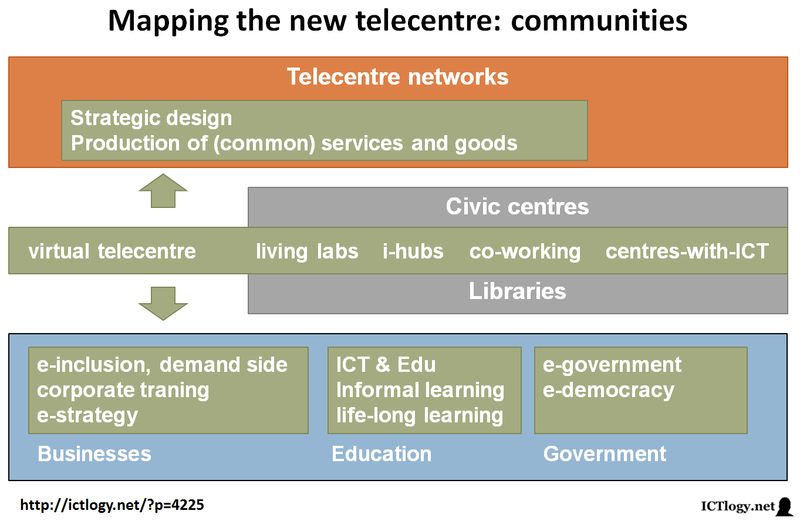 In Netizens: towards a set of digital competences I tried to exemplify how ICTs have become general purpose technologies and are now embedded in the core of our daily lives. Thus, e-inclusion is definitely about inclusion in a very much broader sense. Lastly, New assessment frameworks for new skills provided a comprehensive definition of digital skills which I related, again, with daily experiences and, most especially, with the new ways of learning that Information and Communication Technologies have enabled. The workshop provided me with two positive feelings. The first one is that I got the sensation that there was an overall coherence and consistence in the work that I have been pursuing in the last years (I revisited and reused material of my own from, at least, the last four years). Thus, realizing that somehow you’ve been adding up or building around a core idea (and not just producing splattered thoughts) is pleasantly comforting. The second one is that, at least, most of the theory I handle (of my own and, most of it, by third parties) seems to be having strong strings attached to reality and being ready to provide advice for policy making and project designing. The more feedback I get from people from the terrain, the more I think we’re going parallel (or converging) paths, which, again, is absolutely a good thing to be aware of. Please see below the slides that I used. If they don’t use the Internet, who am I to tell them to: they know better! They’ve been living for ages without the Internet and they surely can carry on living without e-mail or Facebook . Both arguments can, at their turn, be embedded in a major trend now stating that ICTs have neither (positive) impact nor will solve any human problem (economic or not). After a first era of e-enlightenment were the magic wand of ICTs would eradicate hunger all over the place, now ICTs have become almost useless and, according to some, the drivers of all sorts of evils. Though pendulums finally reach their points of balance, the problem is that, while swinging, many arguments are centrifuged out impoverishing the debate. I would like to point out why I believe ICTs need being fostered and, more specifically, why we should encourage people to adopt them and use them intensively. At the end, some shades of meaning — and shadows of doubt — will be provided too. Is economic growth a synonym of development? Certainly not. Will a positive impact on the Economy reduce poverty? Maybe. I believe the Economy to be a means, not a goal. Thus, economic growth (or productivity or efficiency) will just tell us that we’ve got more tools to potentially achieve higher levels of what’s (to me) really the goal: more health, more education and more democracy. An example? FrontlineSMS:Medic is saving lots of money (and time) by using mobile telephony in the healthcare system. And yes, cost is an important part in the equations of economic productivity and efficiency. Aggregate and disaggregate non-economic positive impact. Oh, but not all is about money. Agreed: Fundación EHAS are contributing to save lives by dramatically reducing the time of reaction to a medical emergency by using wireless technologies between healthcare centres. My own University is providing online education to circa 50,000 students, many of them just able to get their diplomas because they can study from their own homes (or workspaces, or wherever they may roam). Many people can, for the first time, follow online the plenary sessions of their city councils or their Parliaments, sometimes even being able to have their say and even decide in e.g. participatory budgeting initiatives. Of course, the disaggregate level is much harder than the aggregate one. As Matti Tedre put it, the fact that plumbers now attend their customers on their mobile phones won’t rocket the demand up: the demand will remain stable and the mobile phone a cost to kill competition. The first one is that, for many knowledge economy jobs, ICTs allow for a leapfrogging strategy, where a minimum investment in capital (technology… we’re taking human capital for granted here) can have high potential returns of this investment. The second one is that while it may be true that demand can remain stable, diminishing costs of transaction can also and actually trigger some dormant demand. Revisiting the example of online learning, I wouldn’t enrol in a University whose courses I cannot physically attend, but I may consider enrolling in an online one where presence is not due. The third one is that, even if considering a perfect zero-sum game, where no-one can win without worsening someone else’s condition, the fact that the barriers of entering the knowledge market are much lower than e.g. entering the steel market, make worth considering fostering ICTs an option. I’m here suggesting that fostering ICTs may be good as to level the economic ground we’re all competing in. Micro level negative impact of non-access. The last statement is closely related to what is to be stated here: most of the times it is not about the benefits of ICTs, but about the negative impact of no ICTs. I am convinced that ICTs can make a change, and increasingly convinced that many things have to change for ICTs to make this change. As catalysts, as multipliers, they need an initial effect which to boost or accelerate. But even to keep the statu quo will need a major adoption of ICTs: if education won’t provide a job, but the lack of education will decrease your chances to get one, ICTs may not improve your well-being, but the lack of physical access to ICTs, lower digital skills or the difficulty to retrieve and produce digital information will certainly increase your risks of being excluded (and not only e-excluded). Like it or not, ICTs have become mandatory even if for staying in the very same spot. So, in an ideal world, higher efficiency and higher productivity and higher everything would free resources so that more rewarding tasks can be performed. The Agricultural Revolution enabled the creation of civilizations and the Industrial Revolution made possible education and health for all. In an ideal world, the Digital Revolution should be able to provide more for more. In a real world, promoting the adoption of ICTs is, at least, a way to stay where you are and not seeing your position getting worse. Not surprisingly, the only ones I heard or read talking about the needlessness of ICT adoption were the ones whose odds to get worse were already small if anything.